Simba is Swahili for lion, and in Namibia, Oshikundu (also known as Ontaku) is a naturally fermented beverage of varying alcoholic strength. Some is mild enough for children, in the way that fermented kombucha is. Some is strong enough that you’d better not drive that lorry from Windhoek to Walvis Bay. Traditional oshikundu is made from pearl millet flour. The people of Namibia call their millet mahangu. Meme Mahangu is the brand to look for, produced by Namib Mills Ltd. and sold in a premixed bag containing a bit of sorghum flour for added flavor. A small amount of hot water is blended with the flour to form a slurry, and then a starter, known as oshihete shoshikundu—a small amount of the previous batch—is added. This is left to ferment overnight, and in the morning more water and some sugar is added to continue the fermentation. In 24 to 48 hours the beverage is ready to drink: a little fizzy, a little sweet and a little tart. Needless to say, oshikundu starter is hard to come by outside of Namibia, as is, for that matter, mahangu. For the enterprising fermentation hobbyist however, there are work-arounds that produce a very nice and in several ways inebriating beverage. A trip to the health-food store, or even the bulk food section of the supermarket will likely not turn up the key ingredient of Simba Oshikundu. That is unhulled millet. The grain found in food stores is invariably hulled, as it has been prepared for eating and cooking as a cereal grain. Hulled millet cannot be sprouted satisfactorily, and this process is important to the creation of the malted millet that forms the base grain of Simba Oshikundu. There is, however, a plentiful supply of unhulled millet readily available in stores, and that is—Budgie Mix. Yes, you can make oshikundu from bird seed, and in fact, the flavor is superior to that made of plain millet. The important consideration is to find a mix that has only seeds in it, and this is usually provided in bulk. The mix that went into Simba Oshikundu consisted of about two-thirds red and white millet, with the remainder made up of canary grass, niger seeds, sesame seeds, and brown flax. I was initially skeptical, but as it turns out, those budgies know good chow! The seeds sprouted very well after about four days, and were dried in an oven until they were golden in color, and toasty in flavor. Then they were ground into as fine a powder as was possible in a small food processor. 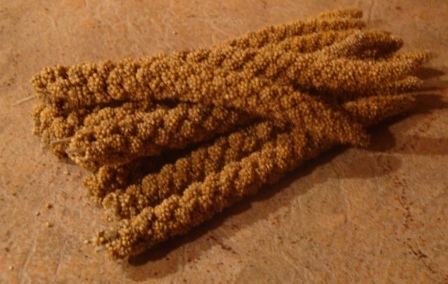 I used the same technique to produce a malt flour from some millet sprays, which are also sold as bird seed. This added an even more toasty flavor to the blend. I mixed the coarse flour with water in a stainless steel pot to make a stiff mash, and raised the temperature to 65-70 C (150-160F.) I added amylase enzyme for good luck and held the mash at that temperature for 18 hours, adding more hot water as the grains absorbed the liquid. The resulting flavor was mildly sweet and grainy. Then in went three kinds of African flowers: Lion’s Tail, Nile Lily, and Lotus Blossom. I brought the mixture to a boil, and simmered it for 20 minutes. Instead of sugar I added wildflower honey, brought the mash back to a boil, and then cooled it quickly to room temperature. I pitched California ale yeast and yogurt starter into the cooled mash, covered it and let it ferment three days at about 26C (80F). When the fermentation was complete I ladled the mash into a large metal strainer to separate the liquid from the grains, and gently poured the brew into swing top bottles, which went directly into the refrigerator. 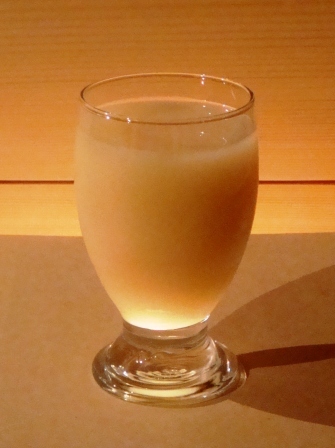 Simba Oshikundu is above all a silky smooth, creamy beverage. It is packed with the nutritional value associated with millet, and is gluten free. The yeast and lactobacillus add probiotic factors. If you can find a source for Bambera ground nut, it can be made even more nutritious. This entry was posted in Uncategorized and tagged beer, fermentation, gluten-free, homebrewing, millet beer, oshikundu, umami.